LookSeeNow: Those ad-guys are at it again. Those ad-guys are at it again. 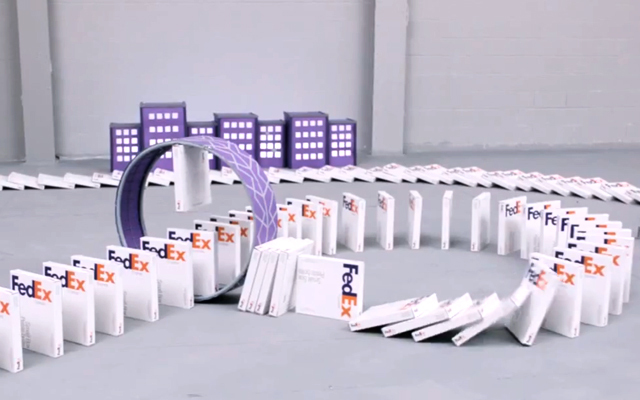 Just when you thought the novelty of a company creating a 'domino' effect with parts of its product had worn off, FedEx have gone an done it as well with their new film, Dominoes (creative title I know). Built over four days and directed by Jeff Low with ad-agency BBDO Toronto, the commercial sees a hockey stick leave Montéal in one of the companies boxes (made famous by the film Castaway) diving through twists and turns through the world, carried through hamster wheels, up mountains, down slides and finally being safely delivered in Miami. The pioneers of the domino effect feature advert are of course Honda when in 2003 they took the parts of an Accord to create the two minute long epic, The Cog, you see below. The film took four days, 600 cuts and 90 minutes on the first day just to get the initial transmission bearing to roll correctly into the second. Follow the links to watch the making of and the illustrated guide on YouTube. Honda is no stranger to creating mini features around their products. The preceding advert to The Cog featured the strapline, "What if?" where they asked "what would happen if the world's favourite word (OK) was replaced with 'What if?'" Earlier this year Honda returned to this question for the competition Live Every Litre in which they posed the question: "What if you had a full tank, an open road and no excuses? What would you do?" The outcome of which saw a woman burlesque dancing in Paris, three guys sail across lake Garda on a bouncy castle and poignantly, two WW2 veterans revisit Normandy. Watch the trailer below and see all the films on LiveEveryLitre.com. Sally has taken part in a workshop discussing social media and community engagement for Honda and The Dream Factory. This does not affect Sally's opinion or editorial content. That OK GO video is indeed a classic. And I'm bookmarking that Spectator article to read later. Fed Ex commercials never fail to entertain me. That's why I only trust this company for my shipping needs. I commend this advertising agency New York because I admire their endless source of creativity. Severed head, sorry, olive on a stick anyone?